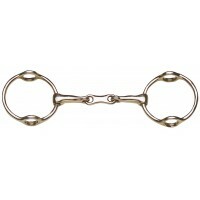 The gag bit works on the horse's lips and poll simutaneously.The pressure on the lips encourages the horse to raise his head, useful for strong pullers, heavy and leaning horses, retraining and correction. 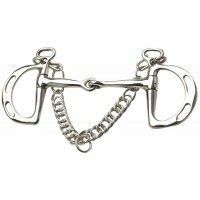 Gags can often be used with two sets of reins, one on the bit ring used as a normal snaffle, the other on the gag or leverage ring used only as needed. 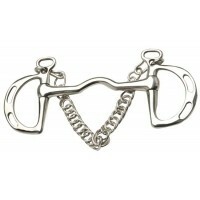 Showjumping / Eventing. Features four rings and hollow mouth. 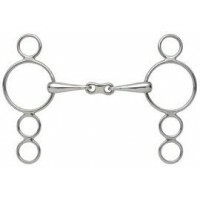 Sizes: 5", 5¼", 5½",..
Dutch/Continental/Three-Ring/Four-ring/Pessoa gag: Similar to the elevator, except the cheekpieces c..
Showjumping / Eventing. Features four rings and hollow copper mouth. 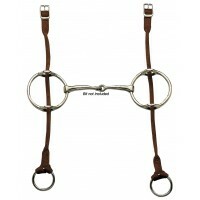 Sizes: ..
Showjumping / Eventing. 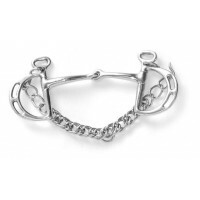 Features four rings and waterford mouth. 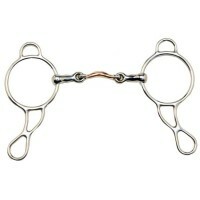 Size: 5" ..
Used with gag straps. 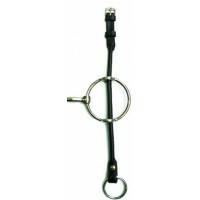 For use with horses that pull by applying pressure to the poll. Mouth T.. 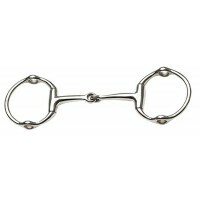 Excellent for horses who pull. French mouth prevents 'nutcracker' action. Used with gag straps. 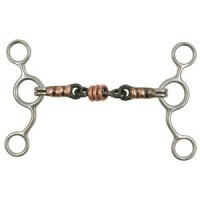 ..
Slotted Cheek - allows rider to alter rein position thus increasing or decreasing the curb action. 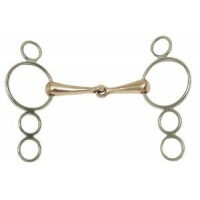 S..
• Three-piece sweet iron snaffle mouth with copper ribs on the outside pieces and three roller coppe.. 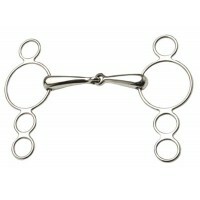 Similar action to the Pessoa but the double joint prevents the harsh "nutcracker" action. Lozen..